The Schulte family sends big hugs to great-grandpa Rowe in Illinois, and great-grandpa and grandma Wessling in Nebraska, and blows kisses to the Schulte, Traughber and Rowe great-grandparents up in heaven. ... and Grampy and Grammy Schulte (Dan's folks). Squeals, jumps and hugs from our younger two. Lovey gazes, warm smiles and tender cuddles from our eldest. As parents, you're blessed to be sandwiched by this special love. You get to watch as your parents shower your kids with adoration, then melt as it flows back with equal intensity. It is truly a gift from above. But, like all holidays, this one can be hard. Some of our friends (now parents themselves) are celebrating Grandparents Day a bit differently than we are this year. They're opening photo albums and telling stories about their parents, who passed much too soon, and praying that their young children will remember and feel bonded to them. 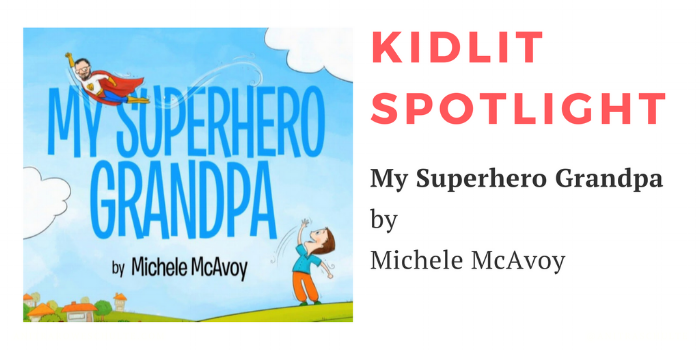 Moms and dads seeking a way to talk to their kids about a grandparent who has passed could find great comfort in My Superhero Grandpa by Michele McAvoy. My Superhero Grandpa came on my radar earlier this year when I became part of the Metamorphosis Literary Agency team. Like me, New Jersey picture book author Michele McAvoy is represented by agent extraordinaire Stephanie Hansen. My Superhero Grandpa, recipient of a 2016 Moonbeam Award, is a sweet picture book that likens a grandparent in heaven to a superhero. It's an apt comparison: Who better to watch over and guide a child then a grandparent with the perfect vantage point on day-to-day life? The warm, vibrantly illustrated book is up-beat, comforting and tender, and the simple prose gives straightforward, positive descriptions of a heavenly grandparent's unique role. It would be a great book to read with a child who has recently lost a beloved grandparent, or with a child whose grandparent passed before his or her birth. This September 2017: Proceeds from all Amazon sales of My Superhero Grandpa this month go to Tuesday's Children, an NYC-based charity that cares for communities impacted by terrorism or traumatic loss. The cause is close to Michele's heart. She wrote My Superhero Grandpa from a place of great tragedy, but through her experience she also found great hope. As an attorney working in Manhattan on 9/11, Michele experienced the devastation of the historic terrorist attack first hand, only to lose her dad just three day's later in an incident unrelated to the fall of the Twin Towers. She recently wrote about her journey in a beautiful piece for The Children's Writers Guild titled, Writing for Children from Tragedy. It's a very timely, emotional and moving read. Remembering can be hard. Remembering can be beautiful. But one thing is ALWAYS beautiful: The special place reserved for grandparents in our hearts. Now and always. Thank you, Michele, for sharing your work and story, and best of luck in your fundraiser! If you'd like to purchase My Superhero Grandpa and support Tuesday's Children, visit the Amazon link HERE. And be sure to follow Michele on Twitter at @michele_mcavoy!